Your system records important events, such as alarms, in Event Memory. You can review Event Memory to monitor the status of your system. As many as 500 events may be recorded, depending upon your system’s configuration. Within Event Memory, your keypad’s zone LEDs light in patterns to identify different events. The table on the next pages shows the various patterns the keypad uses. 1. Press and hold the 5 [walk test] key for 2 seconds until you hear two beeps. Enter the master user code. 3. Press the HOME Key. 4. To view the oldest events first, press 1. To view the latest events first, press 4. The keypad beeps twice. For the next 15 seconds, the zone LEDs display the earliest or latest event. 5.Press 1 to view the next event, or 4 to view the previous event. 6. To exit, press the CANCEL key . 1 2 3 4 5 6 7 8 An alarm occured. A system device was deliberately damaged. A sensor was in need of service. An alarm condition was corrected. 1 2 3 4 5 6 7 8 A bypass on a zone was removed. 1 2 3 4 5 6 7 8 A user cancelled an alarm. An attempt to contact the monitoring station failed. A communications problem was corrected. The system lost its ACT (house current) power. The system’s AC (house current) power was restored. 1 2 3 4 5 6 7 8 The system’s backup battery was low. A low battery condition was corrected. The primary phone line was disconnected. The primary phone line was reconnected. 1 2 3 4 5 6 7 8 The secondary phone line was disconnected. The secondary phone line was reconnected. A medical emergency alarm occurred. A medical emergency alarm was restored. A police emergency alarm occurred. 1 2 3 4 5 6 7 8 A police emergency alarm was restored. A fire alarm was restored. The system was taken out of the programming mode. 1 2 3 4 5 6 7 8 A wireless device malfunctioned. A malfunction in a wireless device was corrected. A wireless device had a low battery. A wireless device’s low battery was corrected. The system reset itself, most likely because of a momentary power loss. 1 2 3 4 5 6 7 8 The sirens or bells malfunctioned. A malfunction in the system’s sirens or bells was corrected. An alarm occurred when an exit door was not completely closed during arming. The duress code was used. The Kidwatch Code was not entered within the Kidwatch window. 1 2 3 4 5 6 7 8 Not used. A test report was sent using phone line 1. A malfunction in a sensor was corrected. A damaged sensor was corrected. A ground fault condition was corrected. A partial power loss occurred (brown out). 1 2 3 4 5 6 7 8 A partial power loss was corrected. An accessory device trouble condition occurred. An accessory device trouble condition was corrected. A sensor was tampered with. Problems caused by a sensor being tampered with were corrected. 1 2 3 4 5 6 7 8 A keypad was malfunctioning. A malfunction in a keypad was corrected. A keypad was tampered with. Problems caused by a keypad being tampered with were corrected. A SpreadNet (wireless) keypad did not communicate with the system. 1 2 3 4 5 6 7 8 Problems with a SpreadNet (wireless) keypad’s communication were corrected. A SpreadNet (wireless) keypad had a low battery. Problems with a SpreadNet (wireless) keypad’s battery were corrected. A system user used the Quick Exit feature. The system’s power was turned on. 1 2 3 4 5 6 7 8 The system had too many messages to report to the monitoring station. A wireless keyfob or remote had a low battery. Problems with a keyfob or remote’s low battery were corrected. A test report was sent using phone line #2. 1 2 3 4 5 6 7 8 User code entry problem, keypad lock. User code entry problem corrected. A SpreadNet receiver interference problem occurred. A SpreadNet receiver interference problem was corrected. 1. Press and hold the 5 [walk test] key for 2 seconds until you hear 2 beeps. When prompted, enter the master user code. 4. To view the oldest events first, press 1. To view the latest events first, press 4. Refer to the next pages to interpret the messages. Press 1. to view the next event, or 4. to view the previous event. To exit, press the CANCEL key. 5 An alarm occurred on the zone listed. A sensor problem was corrected. 10 A bypass on a zone was removed. 15 A user canceled an alarm. The system lost its AC (house current) power. 20 The system’s backup battery was low. A user code was changed. 25 The secondary phone line was disconnected. 30 A police emergency alarm was restored. The system was placed in the programming mode. 35 A wireless device malfunctioned. 40 The sirens or bells malfunctioned. 45 A remote programming session was initiated. An attempt at a remote programming session was denied. An attempt at a remote programming session was successful. A test report was sent to the monitoring station. 50 A user canceled the auto-arming sequence. 55 A partial power loss was corrected. 60 A keypad was malfunctioning. 65 Problems with a SpreadNet (wireless) keypad’s communication were corrected. 68 The system had too many messages to report to the monitoring station. The S5832 control panel allows you to divide (or “partition”) a building into as many as eight areas, regions that can be armed and disarmed individually. Designed primarily for commercial settings, areas can limit an individual’s access to portions of a building. A building that is divided into areas may include a common area, an area most system users can arm and disarm. The first diagram shows how a building could be divided to include a common area. Buildings may also be partitioned without a common area. As the second diagram shows, this setup works well for structures with tenant spaces, but no lobby or shared hallway. Each system user is assigned rights to certain areas. Users can arm and disarm only those areas to which they have rights. When a building is divided into areas, portions of the building can be independently armed and disarmed. In the case of the first building illustrated, an employee can work in the repair shop while the showroom, offices, and warehouse are armed. Similarly, in the case of the second illustration, the restaurant can remain open after the other shops are closed and armed. 1. Users have restricted access to system functions. A user with access to only one area cannot issue commands affecting other areas. 2. Keypads may respond differently, depending upon where they are located and how they are programmed. Your LED keypad is limited to handling information about its assigned area only. As described below, some of the user code types function differently in a partitioned system. Grand Master User Code. The grand master user can assign and change user codes, and may be able to arm and disarm the entire system. Only the grand master user and your installer can view and change the grand master user code. Area Master User Code. Each area has its own master user. The area master user can make any user-controlled changes within a given area. Area Basic User Code. Area basic users can disarm and may be able to arm, bypass, or make other changes within an area. Users can have rights to more than one area. Area Maid Code. Maid Days are assigned to each area, so if you need to change the Maid Days, you must make the changes for each area individually. Kidwatch Code. Your system recognizes only one Kidwatch Code, regardless of how many areas are present. The Kidwatch Code is assigned to area 1. Area Duress Code. One duress code can be assigned to each area. Area Relay Code. One relay code can be assigned to each area. As the table below shows, some user numbers are reserved for specific user types. For example, User 11 is the pre-assigned Kidwatch user number. If programmed, your system automatically restricts User 11 to the limited Kidwatch privileges. When your system does not recognize a given user type, the user number functions like other non-reserved user numbers. If your building is not divided into areas, user codes reserved for areas do not apply. Also, if your building is divided into only two or three areas, codes reserved for the remaining areas do not apply. In a system with multiple areas, an Area Master User can only change the codes of the users assigned to that area. If you attempt to change the code of a user when you do not have the right to do so, you hear an error tone. If your building is divided into areas, your LED keypad is assigned to one area only. From the LED keypad, you can only make changes that affect that area alone. This is described in more detail below. Arming and disarming. Your LED keypad can be used to arm and disarm its assigned area only. You cannot disarm other areas from the LED keypad. Bypassing. You can use the LED keypad to bypass only those zones within the assigned area. Obtaining other system information. From the LED keypad, you can get information about the zones within the assigned area only. Canceling alarms. You can only cancel alarms occurring within the assigned area. Your security system can be armed in a number of ways, to suit different situations. These modes are summarized below. Full Arming: You cannot be inside the building when it is armed with full-arming. If sensors detect movement within a building, or at the building’s perimeter, an alarm sounds. Home Arming (optional): You can be inside the building when it is armed with home-arming. If someone enters the building through a protected door, you must enter a user code, or an alarm sounds. Instant Home-Arming (optional): You can be inside the building when it is armed with instant home-arming. If someone enters the building through a protected door, an alarm sounds instantly. Automatic Arming (optional): Your system can be pre-programmed to arm and disarm at preset times and days. You cannot be inside the building when it is automatically armed. If your system is programmed for quick arming, you do not need to enter your user code before arming begins. Quick arming does not affect how your system behaves once it is armed. For example, there is no difference in the way a system armed with home-arming or quick home-arming protects you. An exit delay is the amount of time you have to exit and secure the building, once your security system begins to arm. These delays last from 20 to 255 seconds, depending upon how your system was programmed. During the exit delay, the Arm LED blinks. The keypad may beep; if so, it beeps faster during the last ten seconds. If any zones are faulted (not ready to be armed), the corresponding zone LED lights and the Ready LED is off. When your system is armed with full arming, both the perimeter and interior zones are armed. You are allowed a specific time to enter or exit the building before an alarm sounds. See Section 8 for the entry and exit delay settings programmed into your system. If your system is programmed for quick fullarming, you do not need to enter a user code. 1. Make sure the Ready LED is lit. Enter your user code. Exit and secure the building. 1. Press and hold the HOME [quick exit] key for 2 seconds until you hear two beeps. Exit the building. 1. Make sure the Ready LED is lit. 2. Press the HOME key and enter your user code. If your system is programmed with an exit delay, you can now leave. While the system is home-armed, the Arm LED is lit, and the interior LEDs blink. 2. Press the HOME key. If your system is programmed with an exit delay, you can now leave. With instant home-arming, an alarm sounds the instant a sensor on the building’s perimeter detects a problem. The interior sensors are not armed. Before anyone can open a door or window, the system must first be disarmed. To prevent false alarms, use instant home-arming only when you are sure no system user will open a protected door or window. If your system is programmed for quick instant home-arming, you do not need to enter a user code. 2. Enter your user code, and press and hold the 9 [instant] key for 2 seconds until you hear two beeps. The keypad beeps twice. The Arm LED and the interior zone LEDs blink. Your system is immediately instant home-armed. 1. Press and hold the 9 [instant] key for 2 seconds until you hear two beeps. Your system is immediately instant home-armed. Your system can automatically arm itself at preset times of the day. At two minutes and again at one minute before the Automatic Arming sequence begins, the siren sounds. Then, the exit delay begins. You must leave the building during the exit delay, or an alarm sounds. You can postpone the Automatic Arming sequence by one hour. When the siren sounds two minutes before arming occurs, press the key CANCEL, then enter your user code. You can change the days that Automatic Arming occurs by following the procedure to the right. To stop Automatic Arming, turn off all of the Automatic Arming days. To change the times that arming occurs, contact your installer. 3. Press the HOME key. The zone LEDs light to indicate the days when Automatic Arming occurs. The zone 1 LED represents Sunday, etc. A lit LED means arming occurs on that day. 4. Press the number of the day(s) you wish to switch on or off. To exit, press the CANCEL key. The zones in your system are not always ready to arm. For example, a zone would not be ready to arm if one of its sensors has been vandalized, needs service, or detects a potential alarm condition. Zones which are not ready to arm are referred to as not-ready zones. Your system has been programmed to automatically handle notready zones in one of three ways described below. Force Arming. With Force Arming, your system arms, even if some not-ready zones exist. All not-ready zones are ignored (bypassed), and therefore, not protected. Exception: Not-ready Day Buzzer or Day Bell zones must be manually bypassed before arming can occur. These are zones that cause a buzzer or bell to sound if they are faulted while the system is disarmed. Chirp-Alert Arming. With Chirp Alert Arming, your system does not arm if a not-ready zone exists. At the end of the exit delay, your system’s sounders chirp. You must re-enter the building and enter a user code, or an alarm sounds. Then, you must either correct or manually bypass these zones before the system can be armed. Goof-Proof Arming. With Goof-Proof Arming, the system does not arm if there are any not-ready exit zones (doors). Instead, an alarm sounds at the end of the exit delay. You must re-enter the building and correct the not-ready zones before arming can occur. Your system offers several optional arming features if installed, described below. This feature automatically resets the exit delay if you re-enter the building while the system is being armed. You may re-enter up to four times; each time, the exit delay is reset to its full value. Keypad Lockout. Designed to prevent an intruder from guessing a user code, this option causes the system to slow down if a series of invalid user codes are entered. Before a new code can be entered, the user must wait through a delay. The delay lengthens as more invalid codes are entered. Depending upon your system’s programming, the keypad lockout may not affect arming. Keyswitch Arming. This accessory (Sierra S5051 or equivalent) allows you to arm and/or disarm the system with a key. Follow the instructions provided with the switch. Exit Termination. This option allows you to shorten the exit delay to the last five seconds by pressing a button connected to your keypad. Automatic Home-Arming. Automatic Home-Arming allows you to remain inside a building while its perimeter sensors (such as doors and windows) are armed. Arming begins by entering your user code. If you exit the building during the exit delay, the system arms both the interior and perimeter zones (full arming). However, if you do not exit the building, the system automatically arms the perimeter zones only (home arming). Any arming command with an exit delay may be canceled before the system is armed. To cancel an arming sequence, enter your user code during the exit delay. 1. Enter your user code. Similar to an exit delay, an entry delay is the time you are allowed to enter the building, walk to the keypad, and enter a user code before an alarm sounds. This delay lasts from 10 to 255 seconds, depending upon your system’s programming. The length of the delay may differ, depending on which door you use. During the entry delay, the Arm LED blinks. The keypad may beep during the delay. If so, it buzzes during the last ten seconds. If your system’s calendar or clock is incorrect, it could result in false alarms. Since many system functions are time-dependent, it is important to regularly adjust your system’s calendar and clock. NOTE: Your LED keypad does not display the current date and time. Therefore, when you set the date and time, be sure to enter the numbers carefully. Reset the calendar and clock after seasonal time changes, such as Daylight Savings Time. Also, even if your system has a backup battery, it is best to check the calendar and clock following a power failure. To convert from 24-hour time to 12-hour time, subtract 12 hours from all times greater than 12:00; these are p.m. times. 1. Press and hold the 2 [clock] key for 2 seconds until you hear two beeps. Enter the master user code. 2. The zone 1 LED lights. (Some of the LEDs in the second row of Zone LEDs may also light; you do not need to pay attention to these lights.) Enter the day of the month, using two numbers. When done, press the HOME key. 3. The zone 2 LED lights. Enter the number of the month, using two numbers. (Enter “01” for January, etc.) When done, press the HOME key. 4. The zone 3 LED lights. Enter the number of the year, using two numbers. (Enter “98” for 1998, etc.) When done, press the HOME key. 5. The Zone 4 LED lights. Enter the hour of the day, using two numbers. Be sure to use a 24-hour format (see the note. When done, press the HOME key. 6. The zone 5 LED lights. Enter the minutes past the hour, using two numbers. When done, press the HOME key. The system returns to its normal mode. When your system is set to chime, you hear three beeps whenever you enter a protected door or window. You can turn the chimes on or off by following the instructions to the right. If the chimes are on, this action turns them off. 1. Press and hold the 4 [chime] key for 2 seconds until you hear two beeps. All of the LEDs blink. 2. Enter the master user code. If you hear three beeps, the tone is now on. If you hear one continuous 3-second beep, the tone is now off. Regardless of which method was used to arm your system, the disarming sequence is always the same. Be sure that the door you use to enter the building has been programmed with an entry delay. 1. Enter through a door programmed with an entry delay. 2. Enter your user code. Your system can automatically disarm itself at preset times of the day. This option must be programmed into your system by your installer. You can change the days that Automatic Disarming occurs by following the procedure to the right. To stop Automatic Disarming, turn off all of the Automatic Disarming Days. To change the times that Automatic Disarming occurs, contact your installer. 3. Press the HOME key. The zone LEDs light to indicate when Automatic Disarming occurs. The zone 1 LED represents Sunday, etc. A lit LED means disarming occurs on that day. If programmed, your system pauses briefly before sounding an alarm. This gives you the opportunity to cancel a false alarm. You can cancel the alarms of any sensor, including a smoke detector. The amount of time you have to cancel the alarm depends upon how your installer programmed the system. Your keypad may beep to warn you that an alarm is about to occur. Five seconds after an alarm is canceled, your system reverts to normal. 1. The Arm LED blinks and your system’s sirens may sound. Press the key CANCEL and enter your user code. The Zone LED blinks to indicate an alarm occurred. To clear the display, follow the instructions below. You should reset your system after an alarm. This action clears your keypad’s display and resets your sensors. 1. Press and hold the CANCEL key for 2 seconds until you hear two beeps. Your keypad is equipped with three emergency keys. The keys do not function unless your installer activated them. If activated, these keys are a one-button way to inform your monitoring station of a medical emergency, a fire, or a crime in progress. 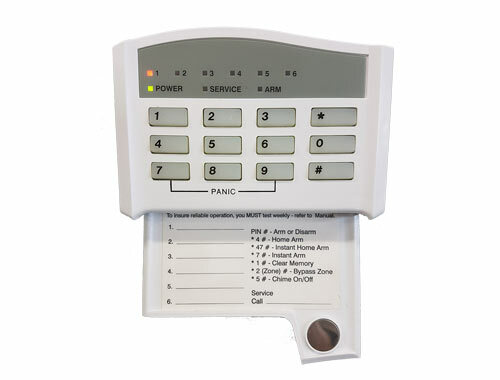 Depending upon how your system is programmed, an alarm may sound when an emergency key is pressed. To cancel the alarm, press the CANCEL key and enter your user code. 1. To report a medical emergency, press and hold the MED key for 2 seconds. 2. To report a fire, press and hold the FIRE key for 2 seconds. 3. To report a crime in progress, press and hold the POLICE key for 2 seconds. You hear a beeping sound when the system is about to arm, disarm, or sound an alarm. The warning tone reminds you that time remains to cancel the arming or disarming sequence, or to cancel the alarm. You can turn the tone on or off by following the instructions to the right. If the tone is on, the action turns it off. If the tone is off, the action turns it on. 1. Press and hold the 7 [pre-warn] key for 2 seconds until you hear two beeps. All of the LEDs blink. Whenever you use your keypad, a light automatically illuminates the keys. This backlight shuts off 60 seconds after you have finished using the keypad. If you wish, you can set the backlight to shine continuously. If you turn the backlight on, you can turn it off again by repeating the procedure to the right. 1. Press and hold the 5 [walk test] key for 2 seconds until you hear two beeps. Enter the master user code. The zone 8 LED lights. 3. Press the HOME key. If you hear three beeps, the backlight is now on. If you hear one continuous 3-second beep, the backlighting is now off. 4. To exit, press the CANCEL key. Your icon keypad communicates information by lighting the words and phrases in the icon display. The words that make up a message may be on different lines, or separated by other words. This message indicates that Zone 4 is not ready to arm. Number symbols (“#”) substitute for the specific numeric information your system displays. The display of your icon keypad gives you information about the status of your system. If there is more than one condition to report, your display switches between the messages. Below is a list of the types of messages you might see. On your display, the # symbol is replaced with the number of the zone (or zones) in question. READY. The system is ready to be armed. READY ALARM ZONE #. The system is ready to be armed; however, the system’s alarm memory contains a record of an alarm. To clear the alarm memory, press and hold the CANCEL key for two seconds. READY BYPASS ZONE #. The system is ready to be armed; however, the zone listed is bypassed, and therefore, not protected. If more than one zone is bypassed, the numbers of the zones are sequentially displayed. NOT READY ZONE #. The system is not ready to be armed. The zone number listed is faulted. (The zone may be faulted if, for example, a door is ajar or a window is open.) If more than one zone is faulted, the numbers of the zones are sequentially displayed. NOT READY TAMPER ZONE #. The system is not ready to be armed. The zone listed has been tampered with. If more than one zone has been tampered with, the numbers of the zones are sequentially displayed. NOT READY TROUBLE ZONE #. A sensor in the zone number listed may need service. Your keypad has a number of LEDs that summarize the status of your security system. Each LED can convey several different messages by being on, off, or blinking. The illustration shows what messages the lights communicate. Zone LEDs If off,the zone is normal. If blinking fast,a sensor in the zone is signaling an alarm, or the zone’s sensor has been tampered with. If blinking slowly,the zone is bypassed. Power LED If on,the system’s power supply is normal. If off,the keypad is drawing power from the battery. If blinking slowly,the battery is low (call for service). Ready LED If on,the system can be armed. If off,a problem exists which may prevent arming. Arm LED If on,the system is armed. If off,the system is disarmed. If blinking fast,the system is about to arm; leave the building. If blinking slowly,you have time to cancel an alarm, before it sounds. If blinking unevenly, system is armed with instant arming. Service LED If on,a system component is malfunctioning and may need service. If off,all system components are normal. If all of the LEDs are blinking, enter your user code. A walk-test allows you to test your system’s functions without causing an alarm. You should conduct a walk-test once a week. The first step of a walk-test is to place your system in walktest mode. Then, walk in front of motion sensors, and open protected doors and windows. Each time a sensor detects your presence, the keypad beeps, and lights the LED of the most recently faulted zone in its display. If your system fails to detect a sensor, exit the walk-test mode and make sure the sensor’s zone is not bypassed. (The LED of a bypassed zone blinks slowly.) If the zone is bypassed, remove the bypass and repeat the walk-test. If your system still fails to detect the sensor, contact your service representative. IMPORTANT: during a walktest, your building is not protected against actual alarms. 2. Press the HOME key. 3. Test your sensors by opening protected doors and windows, and by walking in front of motion sensors. The keypad beeps twice each time you open and close a protected door or window, or a motion detector senses your presence. The affected zone LED lights. 4. When done, press the CANCEL key. 3. Press the HOMEkey. Your system’s bells or sirens ring for 4 seconds. Your system may include a backup battery. If it does, the system will continue to function during a power failure, because it will draw power from the battery. To replace your system’s battery, contact your service representative. Press the HOME key. The keypad beeps three times. The battery test begins. The test takes approximately 3 minutes. To clear the display, press the CANCEL key. When the test is over, the keypad beeps. If the battery’s charge is low, the service LED lights. To replace your system’s battery, call for service. Below is an explanation of the common messages your keypad might display. Beside each message is a discussion of what responses are appropriate. You can get more than one error message at a time. For example, you may note the Zone 3 LED is blinking slowly, the Zone 6 LED is steadily lit, and the Ready LED is unlit. This means that Zone 3 is bypassed, Zone 6 is faulted, and the system is not ready to arm. Power LED is off The keypad is not receiving power, or is not functioning. Verify that the rest of the building is receiving power; then call for service. Zone LED is on A zone is faulted; system cannot fully arm Correct the fault (by closing doors and windows) or bypass the zone. Zone LED blinks unevenly A sensor may need service (trouble zone). Bypass the sensor, or arrange for repair. Zone LED blinks quickly (3 blinks in 2 seconds) The sensor has been tampered with, or has signaled an alarm. Reset the system. If LED continues to blink, call for service. Zone LED repeatedly blinks quickly or unevenly A sensor may need service. Call for service. Ready LED is off Any one of your sensors may be faulted. Depending upon your arming type, your system may be able to arm. If not, correct any faulted zones and then attempt to arm. Zone LED blinks slowly (2 blinks, 3 seconds) The zone is bypassed. Remember the zone is unprotected. You can remove the bypass (see Section 3) or arm/disarm with bypass in place. Your system notifies you if a keypad, sensor, or other system component, needs service by lighting the Service LED and by beeping twice every 30 seconds for one minute. To get more information about the service message, press and hold the 3 [service] key for two seconds until you hear two beeps. One or more of the LEDs of Zones 5, 6, 7, and 8 light. As the table below shows, different messages are conveyed depending on which LEDs are lit. (In the table, lit LEDs are shown in black.) Follow the recommended course of action listed in the table. To stop the service message warning tone, enter your user code between the two beeps. You may have more than one service message. To view the next message, press the 3 key again. If there are no new messages, your keypad exits the Service Message display. 1 2 3 4 5 6 7 8 A wireless keyfob or remote arming device has a low battery The second row of zone LEDs light in a binary pattern to identify which device has the low battery. To replace the battery, call for service. 1 2 3 4 5 6 7 8 Phone line 2 is not working If line is functioning, call monitoring station. If not, call telephone company for service. 1 2 3 4 5 6 7 8 Brown out(power loss short of total failure) When power returns to normal, the system should revert to normal functioning. If not, call for service. 1 2 3 4 5 6 7 8 The monitoring station (phone #1) does not answer If the telephone line is functioning, contact your monitoring station. If not, report the problem to the telephone company. 1 2 3 4 5 6 7 8 There is a power failure in progress Looks for signs of power failure in other building equipment; if not found, call for service. Reset the calendar and clock,once power is restored. Power LED is off The system is not receiving AC(house current)power Verify that the rest of the building is receiving power;then call for service. Display reads: “Faulted…” A zone is faulted;cannot fully arm Correct the fault(by closing doors/windows); or bypass the zone. Display reads: “Trouble…” A sensor needs service Bypass the sensor, or arrange for repair. Display reads: “Tamper…” A sensor may have been tampered with Call for service. Display repeated reads: “Trouble…””Tamper…” A sensor may need service Call for service. Display reads:”Ready” Any one of your sensors may be faulted Depending upon your arming type, your system may be able to arm. If not, correct any faulted zones, then attempt to arm. Display reads “Bypass…” A zone has been bypassed Remember the zone is unprotected while bypassed. You can remove the bypass,or arm/ disarm with bypass in place. To get more information about the service message, press and hold the 3 [service] key for two seconds. You then see one of the messages listed in the table below. If there is more than one message, you can view the next one by pressing 3 again. Follow the recommended course of action listed in the table. When done, press CANCEL to exit. AC POWER LOSS There is a power failure in progress Look for signs of power failure in other building equipment;if not found, call for service. Reset the clock and calendar, once power is restored. BROWN OUT A power loss,short of total failure, has occurred. When power returns to normal, your system should revert to normal. If not, call for service. PANEL LOW BATT The control panel’s battery is low. Allow the battery to recharge overnight. If the problem remains, call for service. GROUND FAULT Power from the system has short-circuited to the ground wire. Call for service. PHONE #1 NO RPT The monitoring station (phone #1) does not answer. If line is functioning, call monitoring station. If not, call telephone company for service. PHONE #2 NO RPT The monitoring station (phone #2) does not answer. If line is functioning, call monitoring station. If not, call telephone company for service. COMM BUFFER OVERFLOW There are too many messages to send to the monitoring station. If telephone line is functioning, call monitoring station. If not, call telephone company for service. PHONE 1 CUT Phone line #1 is not working. If line is functioning, call monitoring station. If not, call telephone company for service. PHONE 2 CUT Phone line #2 is not working. If line is functioning, call monitoring station. If not, call telephone company for service. KEYPAD ## TAMPER Keypad number ## has been vandalized. Call for service. KEYPAD ## TRBL Keypad number ## needs service. Call for service. SN KP # TRBL Wireless keypad number # needs service. Call for service. SN KP # BATTERY Wireless keypad number # has a low battery. Call for service. KEYFOB # BATTERY Wireless keyfob or remote number # has a low battery. Call for service. SELF DIAG FAIL Self-diagnostic failure of a sensor. Call for service. BELL SUP FAIL The external bell/siren needs service. Call for service. You can assign a different user code and user number to each person who operates the system. Your security system supports up to 60 users. If you prefer, you can assign only one user code and user number to a group of users. This is not recommended, since it will then be impossible to determine which individual gave a specific command. A user code is a secret four-digit number, used to arm and disarm the system, and possibly to make other changes. You cannot assign the same user code to more than one user number. It is important to remember your user code, and to keep it secret. Every individual who has a user code is also assigned a two-digit user number. When you change or delete a user code, you are asked for the user number. To enter a user code, simply press the four numbers in succession. Do not pause for more than five seconds between numbers. User codes can be created or changed as often as you like. Any code you select must be four digits long. You cannot use 0000, or assign the same code to more than one user number. Avoid codes that are easy to guess, like 1234. The default master user code (user number 1) is 5832. For security reasons, be sure to change this code to a different number. Do not assign the code 5832 to another user. Your LED keypad does not display the user code assigned to a user number. However, if your system has an alphanumeric or icon keypad, you can use these keypads to view the user codes which have been assigned to the system’s users. If you make a mistake while assigning a user code, you may correct it by repeating the procedure. Be sure to record the user codes, and keep these records in a safe place. 1. Press and hold the 8 [user prg] key for 2 seconds until you hear two beeps. 2. Enter the master user code. Next, enter the 2-digit user number you wish to change. To determine the next available user number, press the HOME key. The zone LEDs light to identify the next available user number. Compare the pattern of lit zone LEDs to the chart on the next page to determine the user number. 3. Enter the new 4-digit user code. The display changes to indicate the next available user number. 4. To exit, press and hold the CANCEL key for 2 seconds. When you are changing a user code, the zone LEDs light to identify which two-digit user number you have selected. Match your keypad’s LED pattern to the charts below to identify the user number. You will know that you entered an incorrect code when the system does not complete your command. As a security feature, your keypad does not beep when you enter an incorrect user code. If you make a mistake entering the user code, simply re-enter the code. You may delete a code by changing that code to 0000. Follow the procedure for assigning or changing a user code. 1. Change the user code to 0000, following the procedure for assigning or changing a user code. TIP Some security systems include wireless keyfobs and remotes, used to arm and disarm the system. If a keyfob or remote is lost, you can protect your building by deleting its assigned user code. Items on this checklist followed by an “X” are features of the user code. The master user can arm and disarm the system, and can make other changes, such as disabling your system’s features, and changing user codes. Depending upon how your system was programmed, basic users may have rights to arm, disarm, or bypass zones. The Kidwatch Code is a four digit code that you can change or delete like any other user code. The code is assigned to user number 11. It allows your children to disarm the system, and can be programmed to allow them to arm or bypass zones. How it works. After arriving home on a day when Kidwatch is active, your children disarm the system by entering the Kidwatch Code. If they do not enter the code by a given time, you are notified. Changing Kidwatch Days. You have the option of changing which days Kidwatch is in effect. To do so, follow the procedure on the previous page. Reviewing Kidwatch Use. You can review the times that Kidwatch Codes were used to arm and disarm your system by viewing Event Memory. See Section 6 for more information. Turning Kidwatch On and Off. Kidwatch can be turned on and off. When Kidwatch is turned off, you are no longer notified of the use of the Kidwatch Code. Otherwise, the Kidwatch Code works as before. If you turn Kidwatch on or off, it remains that way until you change it back. Kidwatch Setup. See Section 8 for the specifics of how the Kidwatch Code was set up on your system. 1. Press and hold the BYPASS [kidwatch] key for 2 seconds until you hear two beeps. All of the zone LEDs blink. 2. Enter the master user code. The zone LEDs of your keypad light to show which days of the week Kidwatch is active. The zone 1 LED stands for Sunday; zone 2, for Monday, and so on. If the LED is lit, the use of the Kidwatch Code is monitored on that day. 3. Press the corresponding number of the day you wish to switch on or off. The appropriate LED turns on or off, to reflect the change. 1. Press and hold the BYPASS [kidwatch] key for 2 seconds until you hear two beeps. 2.. Enter the master user code. If Kidwatch is turned on, the zone 8 LED is on. If Kidwatch is turned off, the zone 8 LED is off. 3. Press the 8 key to turn Kidwatch on or off. Unlike other user codes, which work any day of the week, the Maid Code works only on certain days of the week. The Maid Code is a four-digit user code that you can change or delete like any other user code. Your installer must have programmed your system to accept a Maid Code. For systems without multiple areas (as described in Section 7), the code is assigned to user number 13. It allows an individual to arm and disarm the system on specific days. How it works. Arriving at the building during a day when the Maid Code is active, the maid can disarm the system by entering the Maid Code. Upon leaving the building, the maid can arm the system by entering the same code. 1. Press and hold 6 – the [maid] key for 2 seconds until you hear two beeps. All of the zone LEDs blink. 2. Enter the master user code. The zone LEDs of your keypad light to show which days of the week the Maid Code is active. The zone 1 LED stands for Sunday; zone 2, for Monday, and so on. If the LED is lit, the code works that day. 3. Press the corresponding number of the day(s) you wish to switch on or off. The appropriate LED turns on or off, to reflect the change. As the preceding section shows, the Maid Code can be programmed to work on certain days of the week only. If you prefer, however, you can set the Maid Code to work for the next few hours, regardless of the day of the week. The number of hours the Maid Code works depends upon your system’s programming. The Temporary Maid Code, like the Maid Code, is assigned to user number 13. 1. Press and hold 6.– the [maid] key for 2 seconds until you hear two beeps. All of the zone LEDs blink. 2. Enter the master user code. 3. Press the 8 key until the Zone 8 LED lights. 4. To exit, press the CANCEL key. The Maid Code will now work for the next few hours. If an intruder forces you to disarm your system, this optional code sends a silent signal to alert monitoring station personnel that you are in danger. For systems without multiple areas, the duress code is assigned to user number 15. You can change or delete this code like any other user code. 1. Enter the four-digit code. Your system appears to disarm normally. However, a message is sent to your monitoring station that you are in danger. A relay code acts like a switch. When you enter this code, a device that is connected to the control panel is turned on or off. For example, your system can be programmed to switch the exterior lights of your building on or off when you enter a relay code. Relay codes must be programmed into your system by the installer. The relay code is a four-digit code that you can change or delete like any other user code. If you delete the relay code, you will no longer be able to use this feature. For systems without multiple areas the relay code is assigned to user number 14. At installation, each user number is assigned rights and privileges. For example, user number 18 may have the right to arm, disarm, and bypass zones. This is true even if, in this example, there is no user 18 using the system. Thus, when you assign a user code to a new user, be sure that you select a user number with the privileges you want that user to have. Your installer should have provided you with specific information about how your system was configured. Refer to this information to select the proper user number.